The Villiger Selecto Maduro 5 Cigar Fresh Pack is tagged with free shipping. If you order this product, your entire order will receive FREE BCP Ship Saver shipping! Spicy and sweet with a formidable medium-full body, the Villiger Selecto Maduro pairs a mouth-watering Mexican San Andres maduro wrapper leaf with zesty Nicaraguan binder and fillers to deliver a potent palate-pleaser at an amazing low price. Boasting a peppery profile offset by lush tones of coffee and brown sugar, the Selecto Maduro checks all the boxes for an excellent maduro smoking experience. These resealable 5-cigar Fresh Packs come with built in humidification, simply reseal between smokes and there’s no need to take up space in your humidor. Smooth smoke with an even burn. Was surprised at the whole experience. These cigars were awesome and the price was right. I smoked 1 of each and I enjoyed them all. I definitely recommend these to any cigar smokers !!! picked this up on a daily special. Solid smoke. Wow! First a Great Price! Then the Order got here QUICK!!! Outstanding Service folks!!! When I first opened the package & lit the cigar the cigar went out 5 or 6 Times. Also the burn was not even, I threw the cigar away. Several days later I smoked another one & noticed it was much better with a good draw & nice flavor as well as a decent ash. It was a good smoke and you can’t beat the price point. The fresh pack performed as promised. The packs kept the cigars fresh for months. Still have a couple cigars left from my purchase and they are as fresh as the day I received them. Grab a beer and walk the beach. Good price and burn. 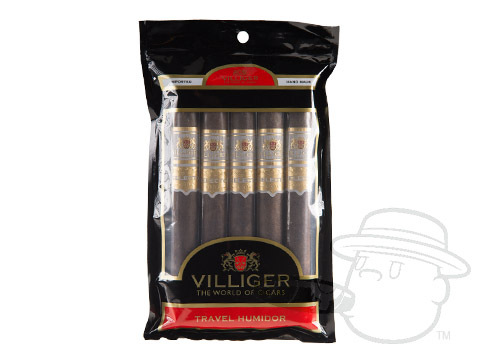 Villiger Selecto Maduro 5 Cigar Fresh Pack is rated 4 out of 5 based on 16 customer ratings.